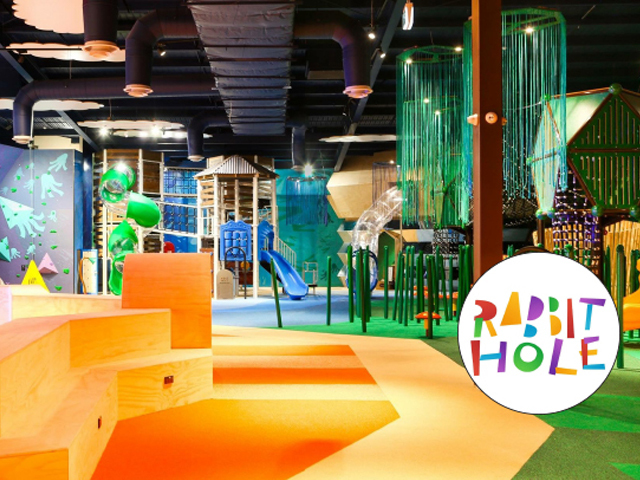 Imagination Play designed the playspace for Australia’s biggest indoor playground, Rabbit Hole, using multiple themes from a vast range of products, including custom-made elements to create the most exciting and vibrant playcentre the company has designed to date. 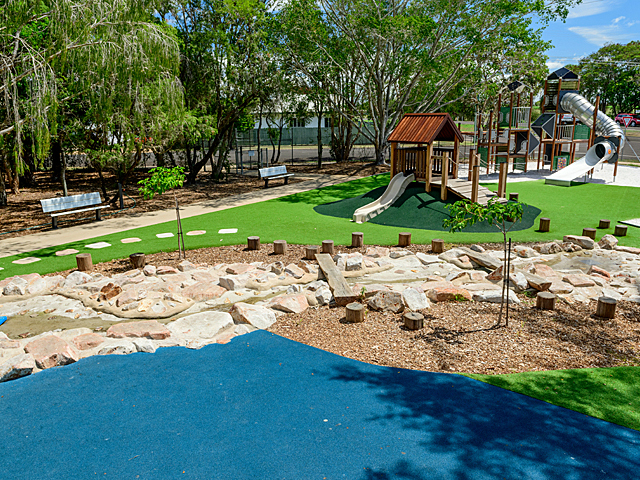 Rabbit Hole Playcentre, situated in Braybrook, Victoria, is designed to be a wonderland for children to explore the imagination of each child as they visit the different “lands” throughout the playspace. 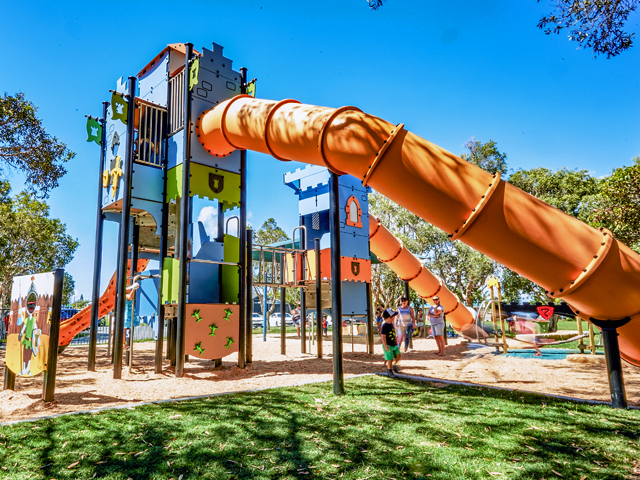 The range of unique theme lands to investigate encourage the children to engaging in play, socialisation and imagination. 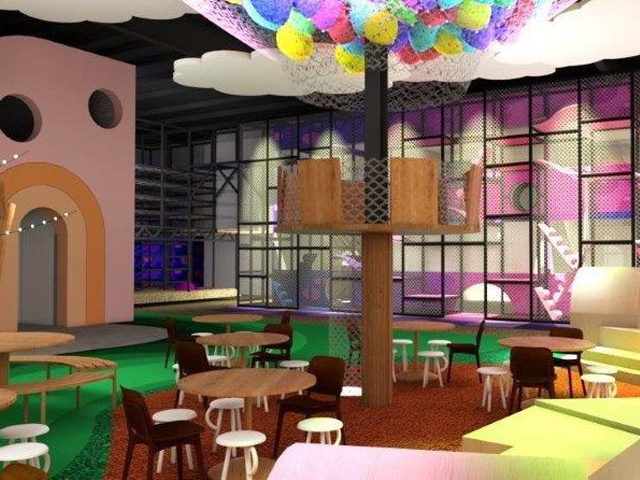 The playcentre consists of a six-metre-high Space World for the children to challenge themselves in a world where they can blast off to the stars. They will participate in an exciting space adventure as they scramble through tunnels and uneven platforms, going higher and higher up the multiple-level structure. The Moonwalk is designed with colourful spongy rubber mounds that allow the children to feel as though they are walking through zero gravity, so that they can explore space and the wonders of the universe. The Enchanted Forest will mesmerise the children as they run through the rainforest, dodging the tall grass pommels, or climbing the treetops from tree pod to tree pod. 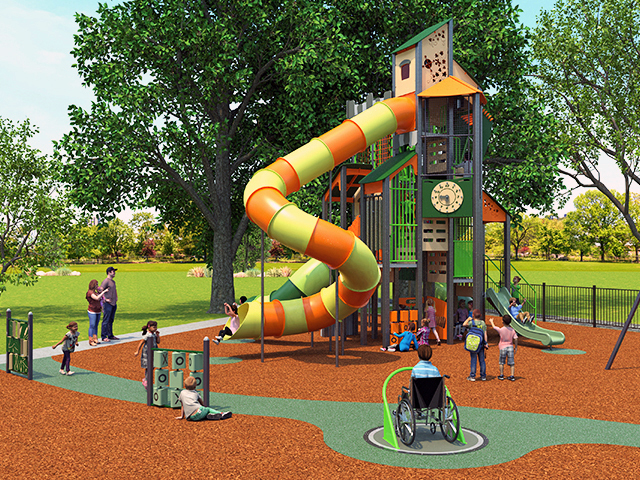 In Babylon children are sent into a mystical tower where they have the choice to speed down a large clear tube slide or visit the connecting Enchanted Forest tree tops. 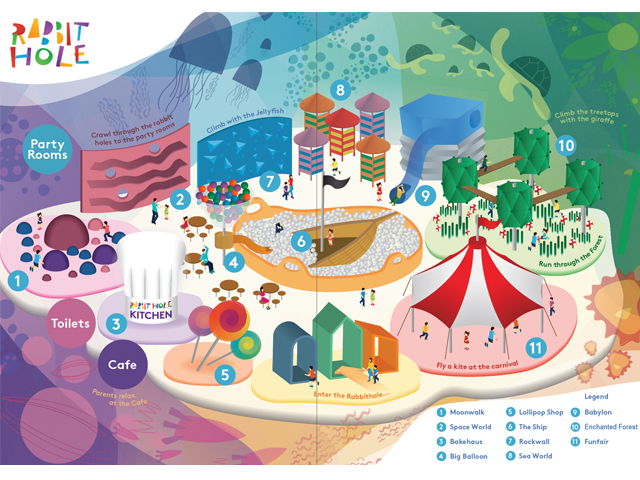 The kids can visit the Funfair area, an illuminated brightly-coloured circus tent where they can be entertained by live performers or test out their cooking skills and learn new recipes in The Bakehaus kitchen. The Sea World consists of three giant beach huts with interconnecting multiple ramps and slides of different varieties. 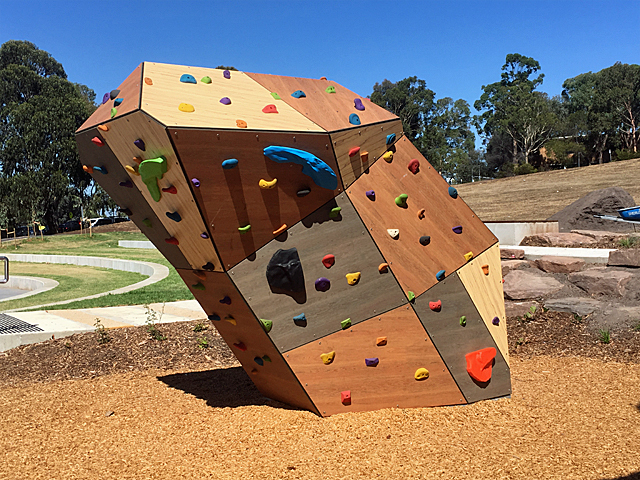 The children can also challenge themselves by climbing the impressive rock wall, fitted with belay systems to ensure the children’s safety. Or they can choose to climb through the rabbit holes and slide into their allocated party room. Rabbit Hole Playcentre has an area to suit all ages and abilities, even including toddlers who can play in the pirate ship positioned in the middle of the playcentre. The ship even has a rope climber for the children to climb onboard. Surrounding the ship is Australia’s largest ball pit that is designed to mimic the effect of water. The toddler area also has a large hot air balloon structure, inspired by the Disney movie, Up. The children can imagine flying high in the sky while looking up at the balloon above their heads which is filled with thousands of vibrant coloured blow up balls. 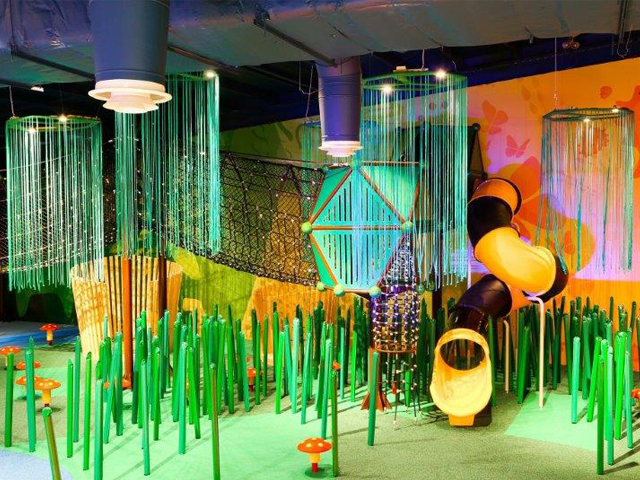 The vibrant colours add enchantment and excitement, and stimulate the bodies and minds of the kids. 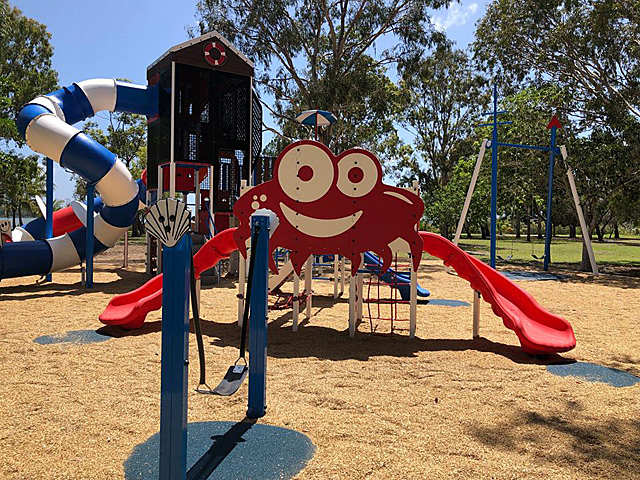 The floor of the Playcentre is covered by brightly decorated rubber wetpour, Flecks® first rubber wetpour job in Australia. Flecks® is a fantastic surface for children’s playcentres and high traffic areas as it is slip-resistant and wheelchair accessible. Flecks®has a low acoustic level, reducing the noise of large groups of children and has excellent resistance to soiling and staining. It is easy to clean and remove sticky substances without affecting the surface finish. Flecks® comes in a variety of colours and can be poured in irregular shapes. It does not contain any harmful ingredients that could affect the children and the environment and includes anti-microbials in both urethane binder and rubber granular to prevent bacteria growth. Imagination Play consider the Rabbit Hole Playcentre their greatest success to date. 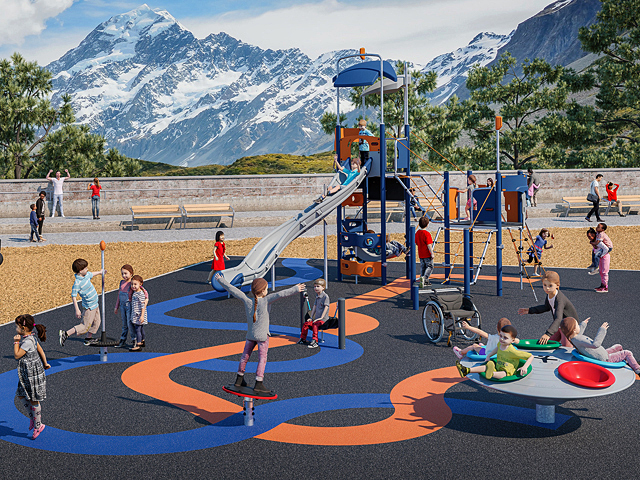 From the bright colours, exciting themed “lands”, high safety rating, and innovative design, this playspace is one that ensures every child will play with their imagination.